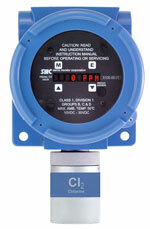 The Sierra Monitor 5100-06-IT chlorine gas sensor features a six-month calibration cycle. The stand-alone module includes a scrolling LED with a magnet-operated menu, 4-20 mA output, RS-485 Modbus interface, SentryBus, and integral alarm relays. Non-intrusive calibration, remote sensors and 316 stainless steel enclosure options are available.